Annoying weather reporting and seeing so many new faces. Where is Sam? Joe Furey is the worst! Ran Frink in Beacon Falls. I love News 8... been watching for over 40 years, however, I’m not loving the app. I can open the app, but it will only show content if WiFi is enabled. I can’t access it without WiFi connection. Most of the time, unless I am home, I do not has WiFi access, so when I am running on data, I get my news from one of the other three news apps. Can you please make your app available to watchers when WiFi is not available? Finally found out how to prevent this app from dropping 4-6 times during each 6PM news show. 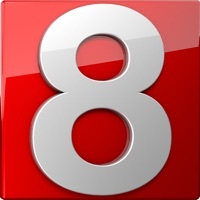 I stopped using the app and stream from the wtnh.com website. Can watch the entire show on Apple TV without any dropping. I had to rate according to how quickly it becomes frustrating after opening the app. I get several notifications per day of breaking news stories, and that’s really the most helpful feature of the app. However, when you try to open one of the notifications to read more, the article isn’t there. It just brings you to some video stream that is slow to buffer, and is not talking about the news story it just notified you of. Looking forward to an update that makes the end user experience more enjoyable. If you folks there at 8 paid some company top dollar to create this for you, you were ripped off. 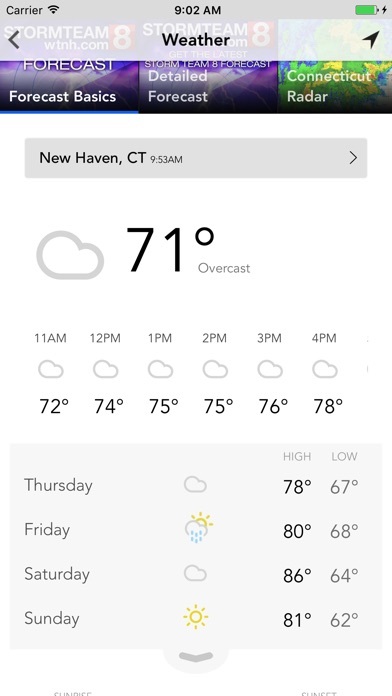 If designing this app was your kid’s project in computer class, then it was a great start, kudos to the little ones because its was better than I could make, but it still needs more tweaking to be professional. I keep this installed because I read the push notifications or whatever fits on the preview of an article. "Click to open app" does that and only that, opens the app where there is no full story. The first couple of times I did this I tried finding the story but either it wasn't there or I realized I'm expected to watch some live feed. Really very irritating and can obviously be better. If someone is inputting some breaking news story, part of which is available as a preview, than the full story must reside somewhere. Why not on the landing page when you open the app? Look at the CNN app for inspiration. Worst local news app ever! I’ve use this app on and off for quite some time and I’ve seen the improvements over the different versions, which is great. 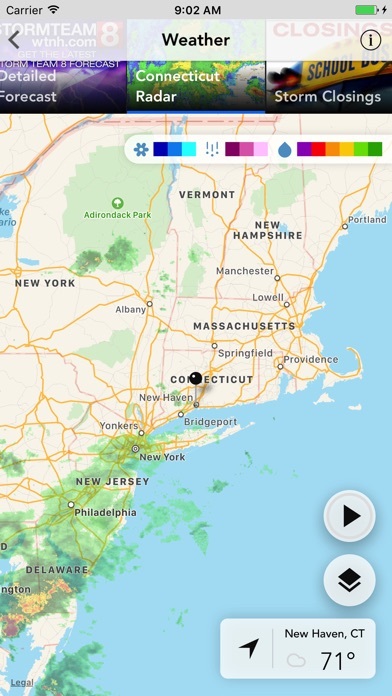 I like the fact that I can see the live forecast & the CT news coverage. I could be exercising, on the go and still receive the news... I love it. One of the improvements I wish you could make is a better way to get to that daily live news coverage. The main menu says live breaking news which is really for special events/breaking news but I have to click around to get to the daily live news coverage, which wasn’t always the case in older versions. Another request I would suggest is the availability to use the app on Apple TV. Other than that thank you for the app! I have stopped watching Channel 8.....miss Gil and Darren. Cannot watch the weather with Joe. Kevin being tossed to the curb was bad enough and then on top of it...Fred....time for a change.....get your act together. 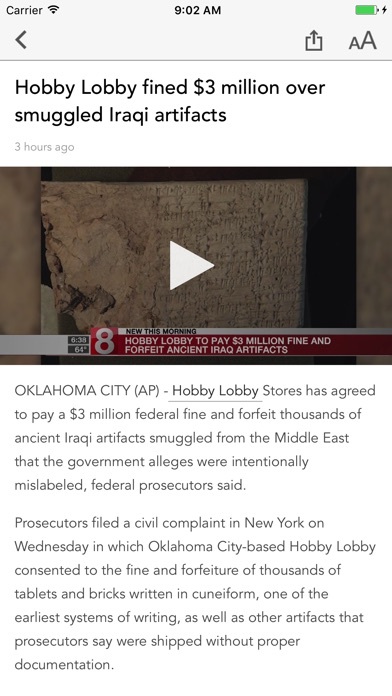 Love the news articles but ad’s pop up too much. I don't have weather notifications on but I get constant notifications even if it only MIGHT rain. I only want news notifications!!! I’m a CT ex-pat in WA. It’s great to see the station I grew up with and keep in touch with home. Ch. 8 is only three years older and I watched the day it changed from Ch. 6 to 8. Also remember Happy the Clown, Capt. C. Whiskers and Admiral Jack. And of course, Mis-ter Goober. By Cant even send a review!!! Too many pop up ads. Traffic cameras not updated and take too long to load. Good job for keeping us informed. 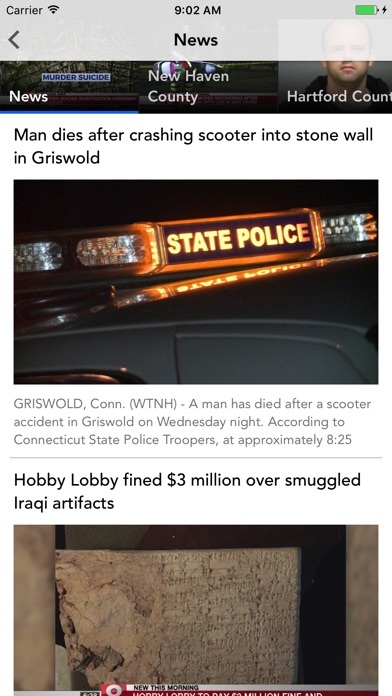 You’d think WTNH would have a good app like some of the other ABC newscasts. Unfortunately that is far from the truth. 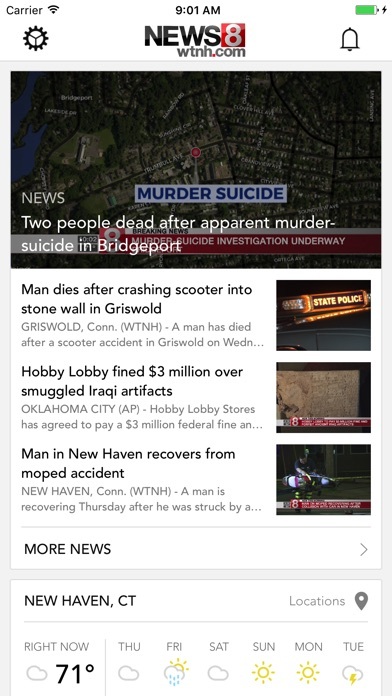 1) Alerts pop up for breaking news then the app doesn’t show the article at all. 2) Other articles show on app, when you click on it to load, it takes you to a video screen saying “they’ll be right back” and never plays. No written article, can’t read NOR watch it. 3) Under each written articles, there are phrases from other news, but that’s all to it, you can’t click on it, you can’t see anything other than just that phrase. Not to count the pop ups. App deleted, gave it a shot, totally not worth it. To much on the weather reports. Slacken off !! Seldom covers what is hot in New Haven. It’s good if you want to know about the tree that fell in Barkhamstead or the traffic light malfunctioning in Bozrah but for local news it can do much better. I downloaded the app so I could watch live streaming news but all I get are the same commercials over and over again. Id like to watch the news. Even Maine has news on-demand! MAINE! I end up watching Foxct 61 which is not the station I want to watch. I hope someone can help. I use the app every morning to listen to the weather and lately it keeps shutting down in the middle of using it. Disappointing to say the least. Great app!! Ch8 is my favorite news cast!!!! PLEASE. Fire Mr Joe Fury. You are losing many viewer because of him and all his nonsense. Every time I go on this app I have to swipe up to get rid of the advertisement..
Way too much advertising make it difficult to get to content. This what a news app shouldn't be, if you can get pass the constant barrage of ads,chances are the app won't load the right story. The app is hard to navigate and basically useless... but if ya want ads, it's great!